Dress to impress with this fancy Handmade Boho Style Beaded, Shell Wristband Bracelet. 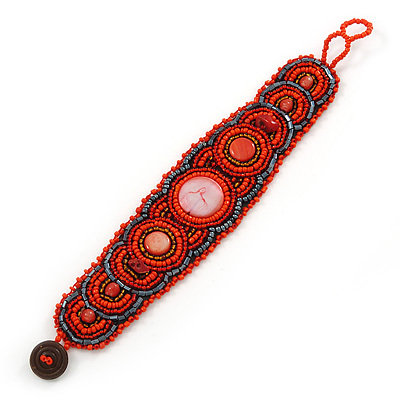 Featuring a wristband style bracelet, made of shells and glass beads in hues of red, orange and hematite. The back of the bracelet covered with a black coloured synthetic fabric. The bracelet measures about 160mm in length, and about 35mm in width, with an additional 20mm extender. Secures with a double loop and a button clasp, keeping it securely in place at all times. Look like a fortune - without spending one!